The American Bulldog is extremely athletic, powerful, and muscular. Strong and agile, this breed is very swift and is capable of leaping heights of six feet or more. They are brave, alert, courageous, and fearlessly determined. American Bulldogs are typically friendly, happy, and devoted. They get along very well with children but due to their size are best suited for homes with older considerate children. They will generally do well with other dogs they have been raised with but do not do well with other small household pets or cats. The American Bulldog is a faithful and loyal companion that has strong guarding instincts. They are reserved and wary of strangers and aggressive toward dogs they do not know. This breed is not recommended for the novice dog owner. The American Bulldog has a close fitting coat that is short and harsh. The coat color comes in solid white, with various combinations and patterns of brown, tan, red, and brindle. This breed is an average shedder. Early intense socialization and obedience training are an absolute must for this breed. They will not respond to harsh or heavy-handed methods. Training must be done with firmness, fairness, patience, and consistency. 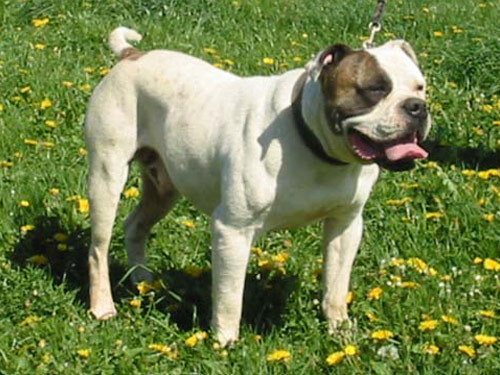 The American Bulldogs talents include tracking, hunting, schutzhund, weight pulling, and guarding. The American Bulldog does best when they are given a job to do. They enjoy frequent securely leashed walks, family play sessions, and romping in the yard. This breed does best on a farm with room to roam or in a home with a large fenced yard. They will do okay in an apartment dwelling provided they are given sufficient exercise, attention, and stimulation.